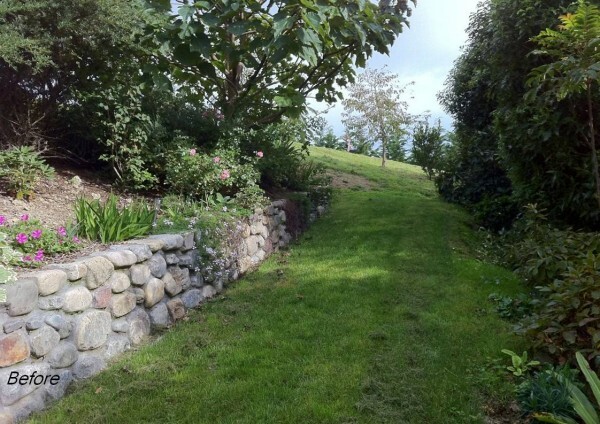 "This area of our garden is very steep and uncomfortable to walk on. We need some wide steps with planting." The scene in the photograph consists of established vegetation on either side of a grassy slope that opens to a large lawn at the top with a deciduous tree centered on the pathway. 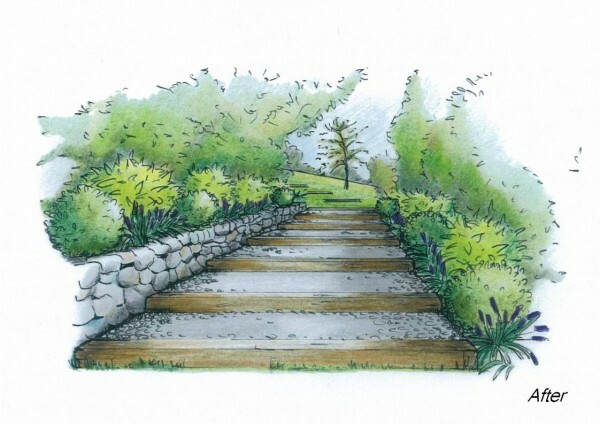 Steps made of rustic materials such as railway sleepers combined with pebbles or gravel are in keeping with the rural character of the garden. For a less abrupt change from steps to open area at the top, the rhythm of the steps can be continued with in-ground railway sleepers in the lawn beyond. Curving the line of railway sleepers to the left, following the curve of the left-hand planting area, reinforces a sense of mystery without interfering with the main viewing line to the deciduous tree on the lawn. With age, and thus with size, the latter will become a stronger focal point. The gardens on either side of the pathway receive very little sunlight. A simple planting schedule can be used here with shade-tolerant plants such as Aucuba japonica 'Crotonifolia', Skimmia x confusa 'Kew Green' (or a Skimmia japonica cultivar), and Liriope muscari (lily turf) as ground cover. A pattern of a limited palette of plants in a more or less symmetrical fashion on either side of the steps, defines the edges, creates a stronger frame for the view to the tree beyond, and contrasts well with the more nature existing plantings.